I think someone asked me early on what my objectives or goals were for this trip. If you remember what I wrote at the beginning, it shouldn't surprise you to know that I just wanted to make it from beginning to end without abandoning Wayne. 1) Fear - There were only a couple times when I felt that our safety was in jeopardy; I was more concerned about the boat crashing into a dock or hitting a bridge. I really did feel a sense of peace that could only have come from the Holy Spirit's presence. Of course, Wayne's caution and skill at navigation, piloting the boat, docking, etc. cannot be overstated. I was very impressed by that. 2) I did very well on the trip and never entertained the thought of flying home. I became more of an asset to Wayne as time and experience gave me confidence and skill. 3) I still don’t have a passion for sailing, but I do love to travel on the boat, visit new places, and spend time outdoors, so I enjoyed all the places we visited and sights we saw. 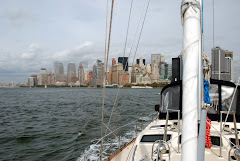 And yes, I even enjoyed the sailing...tremendously. 4) It was a long trip and I wouldn't have wanted it to be any longer. Yes, I missed my land life, but this experience was worth giving it up for 109 days. 5) Communication was seldom an issue. We were pleasantly surprised to have cell phone service probably 90% of the time. We had the satellite phone for backup, but didn't need it much, and we never went more than a few days without having internet service available. 6) Although there were some lonely times, we were blessed with visits from family and friends along the way. Traveling with Claus and Rachael came at a time that would have otherwise been the loneliest, as we were in remote areas. The blog and email were lifelines for me. 7) Wayne and I did just fine with so much togetherness; we both put a lot of effort into making it work and we got along very well. In fact, in response to the many people who asked, it was actually good for our relationship. Hmm...maybe this retirement thing won't be so bad after all. The only thing we might have done differently would have been to do the trip in segments, an option that never occurred to us at the time. It would have made for a much more leisurely trip, but we probably would have done it the way we did anyway. Because I had so many concerns about doing this trip, the fact that I did it is so much sweeter...a personal victory of sorts. It reminds me of the huge feat of overcoming my fear of water to get my scuba diving certification and going 100 feet deep when I had no intention of going deeper than 20 feet. So there you have it. And here I end it. I expected to be seeking out a 12 Steps group for recovering bloggers, but it doesn't look like I'll have a problem. Although there will probably be be other blogs for me in the future, it's sad to say good-bye - I miss you already. The Lena Bea blog has been a vital link to you, a creative outlet for me, and a memoir of our trip, but this chapter is now complete. Thanks for reading. 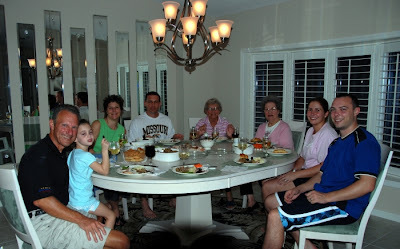 Left to right: Wayne; granddaughter, Alex; daughter, Suzanne; my favorite son-in-law, Brian; my Mom; Wayne's mom; my favorite daughter-in-law, Amy; son, Michael. I don't know if anyone out there still cares, but I haven't forgotten about doing a final post to the blog. We've been delightfully occupied with company and our Thanksgiving celebration, but everyone's gone now, so I should have time to add to the blog tonight or tomorrow. I hope you all had a blessed Thanksgiving. I hardly knew what a blog was before this trip, but Wayne and I both knew we wanted to do one as a simple way of keeping family and friends abreast of our journey. It quickly took on a life of its own, though, as we realized other benefits and I became a blogoholic. This blog has been a blessing in many unexpected ways. First of all, I was amazed at how many people were reading the blog - not just friends and family, but their friends and family as well - and how interactive it became. You encouraged us and cheered us on. We received so many comments and emails from readers, and suddenly it became a lifeline of sorts. It helped alleviate loneliness and became my social life. I developed a compulsion to write and couldn't believe I had so much to say. As the trip progressed and our memories were already beginning to blur (Where did we...? When did we...? What was the name of...? ), we realized how important the blog was for ourselves. Now, due in large part to your encouragement, we're even entertaining the idea of putting it into a book for our children and grandchildren. If you've ever thought about doing a blog - or even if you haven't - I encourage you to try it (especially you, Paula G.). My cousin, Tracy, keeps a family blog with beautiful photos and very fine writing; (http://tracysscrapbook.blogspot.com/); I can only imagine how precious it will be to her children some day. Although blogger.com has a frustrating array of bugs and glitches, it's very easy to set up and use. By the time you read this, there will probably be more options available. And if you do have a blog or decide to start keeping one, please share it with me at msharprm@gmail.com. I haven't decided whether I will start a new blog - our normal life is pretty boring and not particularly blog-worthy - but would enjoy reading others in the meantime. Finally, to those who have faithfully kept up with our blog or even just checked in periodically, we are humbled and grateful. It means so much to us that you care enough to take time out of your busy lives to follow our journey. I feel a bond with you because it's almost like you were with us. When people ask, "How was the trip?" I don't know where to start, but I want to say, "Read the blog - it's all there." If you were with us on our journey via the blog and have kept silent so far, I'd love to hear from you. There will be at least one more post before I wrap this up, so please check back. During the past 3½ months, we learned that there's another world out there, fully experienced only from the water, with texture, ambience, sensations, and culture so foreign to me, being a Minnesota girl. 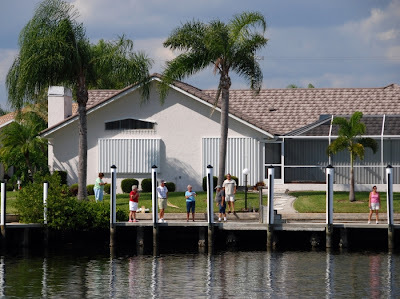 It is a world of marinas as varied as a Motel 6 is from the Ritz-Carlton, communities on the water where people live, work, play, and socialize, or in our case, simply pass through (we're referred to as "transients"). It is a world whose livelihood is dependent on the sea and where many towns have memorials to honor those lost there; it is a world where fishing boats seem to outnumber cars, and lobster and crab pots seem to outnumber people. It is a world of peaceful anchorages, wilderness areas, sandy beaches, marshlands, rocky and wooded shores, lighthouses, small fishing villages, beautiful resort towns, large commercial sea ports, all types of housing imaginable, and metropolitan cities - both modern and steeped in history. It is a world of barges and hard-working tugboats, alert and wary Coast Guard boats, impressive freighters and cruise ships, classic and regal-looking tall ships, intimidating war ships, car ferries, tour boats, luxury yachts, lazy trawlers, high-powered cigarette boats, and recreational sail and power boats of all sizes and descriptions. 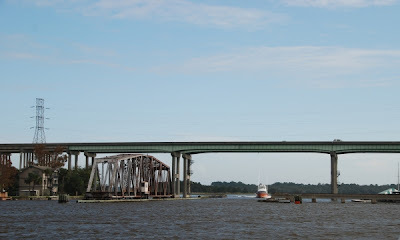 It is a world of swing bridges, lift bridges, bascule bridges, and of course, 65' fixed bridges. It is a world where the sea is more than just water - it's a living organism with a temperament and personality, a powerful being who can toss us, rage against us, frighten us, delight us, calm us, lull us to sleep, and yes, make us a little queasy. It is a world where whales dominate and inspire awe, seals swim by curiously and inspire humor, dolphins frolic and inspire joy, and manatees bathe lazily and inspire love. It is a world where people are...well, people - no different from people everywhere, and we smile as we remember them fondly. Each person we met along the way left an imprint on our hearts and made our journey a richer, more textured and colorful experience. There are too many names to mention, but we are grateful to all who contributed to the memories we'll savor of this trip. A special "thank you" goes to those we encountered en route who joined us on our journey and cheered us on via the blog, like Roberta. We are so grateful for the privilege of experiencing this other world for the past 3½ months. The spiritual aspect of this trip was profound. First of all, we felt the power and blessing of your prayers every day, and for that we thank you. As I've mentioned many times, God blessed us with unbelievably superb weather throughout the trip. He kept us safe and healthy (except for two minor visits to the ER) and protected us from countless things that could have gone wrong. So often in our busy lives it's hard to make room for God. Even if we take time for prayer, study, worship, and service, the communication is mostly one-way because we're immediately on to the next thing and often fail or forget to listen for God's voice. We're busy with work and family obligations, and in our free time we often live in a world of television, radio, iPods, Blackberrys, telephones, computers, and what have you. God could be screaming at us and we wouldn't hear him above the din. Wayne and I were without TV, radio, newspapers, and except for occasional evenings, music, for 3½ months; four months ago, I would have panicked at the very thought (we thought we were equipped). Work was mostly limited to boat stuff, navigation, and trip planning, if you can call that work. 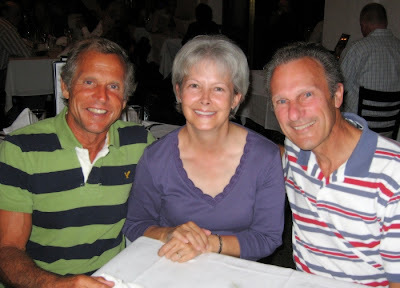 Our only family obligation was to keep in touch, which we did by cell phone, email, and blog. Of course, there's no escaping electronics altogether, even at sea; the navigation and weather instruments are vital. Without so many distractions, we learned what it really means to abide in Christ. He was our constant companion and we were always aware of his presence, often spending most of the day just enjoying our Lord's creation and our relationship with him, steeped in his love and peace. We were more "tuned in" to him, which allowed him to guide our travel and protect us to a degree that wouldn't have been possible otherwise. I experienced peace that could only have come from the Holy Spirit in the face of many hair-raising situations, scores of low bridges, and vast expanses of shallow waters. I experienced joy that I didn't even know how to express, and which also could only have come from Him. Every day we were blessed and awed by the wonder of God's creation. The variety and beauty of birds, trees, clouds, winds, rocks, terrain, aquatic mammals and fish, sunrises and sunsets, flowers, land creatures, sea shells, water - and of course, homo sapiens - fascinated and delighted us as much on day one and mile one as they did on day 109 and mile 5,325. We've been home four days now and are gradually getting our land legs back, both literally and figuratively. Our first day or two, I kept wanting to secure things around the house so they wouldn't go flying. I kept looking at the boat docked behind the house, wondering why it looked so strange; it finally occurred to me that we have one home parked in the backyard of our other home. We're getting used to having "luxuries," like a dishwasher, TV, radio, laundry facilities, a roomy shower, a king-sized bed, and as much internet access as we want. We're getting used to being more than 30' away from each other. It feels good to be back on land, back to our "normal" life. I was looking forward to being able to sleep later than 6 a.m., but ironically I've been up before Wayne every day except one, wide awake at 5:00 or 6:00. We've had fun talking to and getting together with friends, but there's also been a lot of work to do. Besides the usual stuff involved in opening up the house after being gone for six months, we've had boat stuff: unloading it and trying to find room in my kitchen for extra food and duplicate containers of everything in the frig. I'm still working on that and expect to make a run to the local food shelf once I get organized. Wayne spent most of yesterday cleaning the outside of the boat - there was already oxidation from the salty air and water - and I'll take care of the inside...when I get around to it. After we finish the boat stuff, it will be time to prepare for Thanksgiving, which we will celebrate November 24th, the Saturday after. Michael and Amy are flying down on Thanksgiving, and our moms, Suzanne, Brian, and Alex will arrive on Friday; they'll be here for five days. We're so excited about having some quality time with family. It seems much longer than four months ago since we saw them. Yesterday we made reservations to fly home to Minnesota on December 5; we'll be there for about a month and will drive back down to Florida in January. Captain Wayne: After leaving Miami, we sailed in nearly perfect conditions. We took the Hawk Channel, which is the outside route, vs. the ICW, but it is still inside the reefs that are south of the Keys. 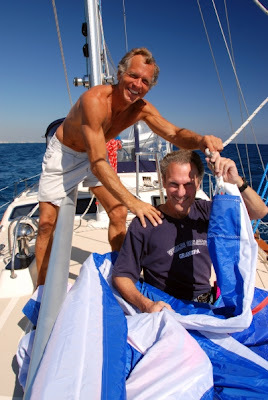 We had a downwind wing-on-wing sail on the first day (genoa and main sails on opposite sides of the boat), a spinnaker run the second day, and when we headed north in the Gulf of Mexico, the wind was off the beam. What a great way to end the trip! We did take a short cut at Marathon, going under the Seven Mile Bridge and through the Old Spanish Channel to the Gulf of Mexico. We covered 4,630 nautical miles (5,325 statute miles) and traveled for 109 days. 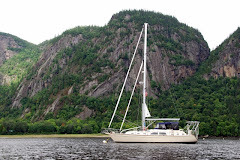 We were in four Great Lakes, the St Lawrence Seaway, the Saguenay Fjord, the Gulf of St Lawrence, the Atlantic Ocean, the Gulf of Mexico, and countless bays, rivers, lakes, channels, and canals. We negotiated 18 locks as we descended about 900 feet from Lake Superior to sea level. We visited five Canadian provinces and 18 U.S. states. We spent 62 nights in marinas, 34 at anchor, eight on moorings, two docked behind a friend's house, and we sailed through the night on three occasions. We spent time in about 46 different towns or cities. We met a lot of great people in the places where we stopped and met many cruisers headed to different parts of the world. Friends and family visited us along the way, and more would have joined us if we could have made the schedules work. We tested and refined our knowledge and skills with the boat, navigation, weather, unfamiliar waters, currents, and tides. We also worked well together as a team. As much as we enjoyed getting to our home in Punta Gorda, I already miss being on Lena Bea, and I am looking forward to our next voyage. I am glad we could share our adventure with all of you. Thank you for your emails, blog comments, and calls. Stay tuned for more thoughts from Michele. We have the best neighbors in the world. 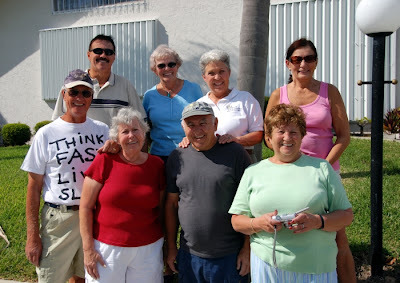 What a thrill it was to turn down our canal and see Mom and the neighbors waiting for us on the dock, cameras in hand. We were euphoric! We docked in our very tight spot with the help of Bill, Bob, and Al. Marge handed us a dozen roses and a bottle of pre-chilled champagne and they all took our pictures. We felt like celebrities. Norma and Jay invited us, Mom, Bob, Barbara, and their brother-in-law, Ronnie, over for spaghetti dinner. Barbara is a talented professional musician who treated us to piano and singing after dinner. Norma and Jay sing beautifully as well, and they sang along while the rest of us feebly attempted to sing if we knew the words. It was such an enjoyable evening, and a wonderful welcome home. Yes, we have the best neighbors in the world. My dad would have celebrated his 88th birthday today. There are more posts to come as we collect our final thoughts and photos (and wits), so please check back. As we glided through Charlotte Harbor, approaching Ponce de Leon inlet which takes us into Punta Gorda Isles, a couple of neighbors called us and said, “Don’t come in yet! The tide is too low and you’ll go aground!” Hmm, let’s think about that for a minute: We are half an hour away from completing a 109 day, 5000 mile trip and we’re going to stop and wait who-knows-how-long for the tide to come in? I don’t think so! In a final act of defiance, determination, and faith, we plowed our way through the inlet, churning up the sand as we dredged our way through the shallows. 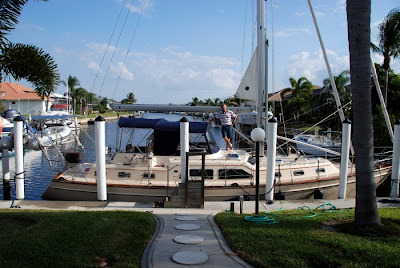 One of our favorite things to do when we're in Florida is to take our little power boat over to Cayo Costa, one of the barrier islands in Charlotte Harbor. It's a state park, largely uninhabited, and accessible only by boat. 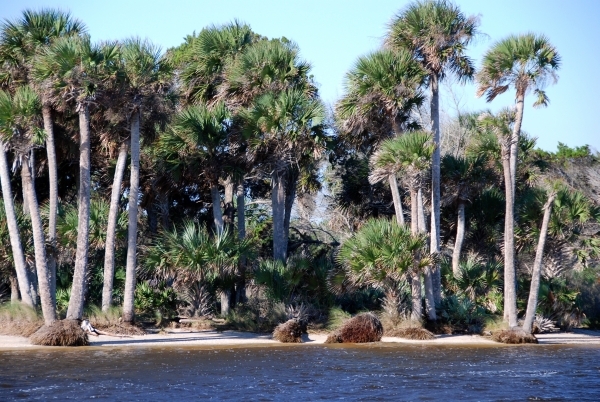 We like it because the long, beautiful beach on the gulf side is usually almost deserted and has great shelling. I've often longed to anchor offshore, walk the beach till sunset, spend the night, and walk it again the next morning, which wasn't do-able in our little 21’ Hurricane. It was so fitting then, that wind conditions and timing made the gulf side of Cayo Costa the best place for us to anchor tonight, the last night of our trip. We anchored at around 3:30 and were headed in to shore in the dinghy when we noticed there were dolphins all around us - several pods with too many dolphins to count. We've never seen so many at one time before! We cut the engine and sat there watching them, certain that God had sent them to welcome us home. As we pulled the dinghy up on shore, the first thing I saw on the beach was a sand dollar, my favorite shell. I walked and combed the beach until sunset, when Wayne had to almost drag me away, as always. We watched the sun disappear into the Gulf of Mexico, the last sunset of our trip, and sat in the cockpit drinking champagne and eating brie and crackers. We toasted our last night - unbelievable! - of an awesome journey. 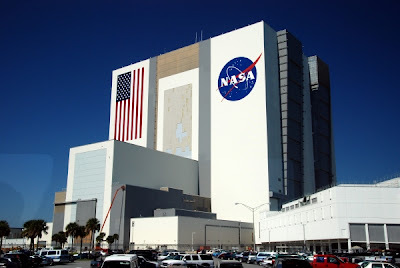 We haven't had internet access since leaving Miami, so you may be surprised to hear that, as I write this on Sunday morning, we're approximately 26 hours from docking behind our home in Punta Gorda. Skipping a stop in Key West brought us one day closer to home. We anchored off the coast west of Everglades City last night; we just passed Naples and expect to anchor off Useppa Island or Cayo Costa tonight. From there we're about four hours from home, but we promised Mom, who wants to be waiting on the dock when we come down the canal, not to arrive before she gets there, around 12:30-1:00. She helps teach a line dance class Monday morning, and with the two hour drive, can't get there before then. No problem, Mom...after 3½ months, we can sleep in a little on our last day and take our time. The journey isn't over yet, though, and we'll have more to say when it is, so don't leave us yet. We've had our best and longest stretch of fabulous sailing of the trip since leaving Miami; we've sailed every day and it's been close to perfect. Today and tomorrow promise to be the same. On a totally unrelated note, I just finished reading a book, Epicenter, by Joel C. Rosenberg, which blew my mind, opened my eyes, and changed my thinking. I'm highly skeptical of things I read, but Rosenberg convincingly establishes his credibility in the first few chapters of the book. He is well-respected by world leaders and other influential people, and has interviewed an impressive array of top political, economic, military, intelligence, and religious experts from the U.S., Russia, and Middle East. In Epicenter, he writes about recent, current, and future events in the Middle East in light of biblical prophecy as recorded in Ezekiel 38-39. Although this book is non-fiction, Rosenberg has also written several political thrillers about the Middle East that proved to be startlingly prophetic, one of which opens with radical Islamic terrorists hijacking a plane and flying an attack mission into an American city. He wrote it before 9/11. Gary read Epicenter when he was with us and I couldn't wait for him to finish so I could get my hands on it. Wayne is next in line. You can learn more about it at www.joelrosenberg.com. I can't recommend it more highly. We left Miami Beach around noon on Thursday and sailed 31 nm in the Atlantic to an anchorage south of Key Largo. Friday brought us 74 nm closer to home with another day of idyllic sailing south of the Keys. We aborted an intended layover in Key West for Saturday when I called the local marinas for reservations and learned they were all full due to a big power boat race this weekend. We were sure glad to know about that in advance so we could steer clear of it. 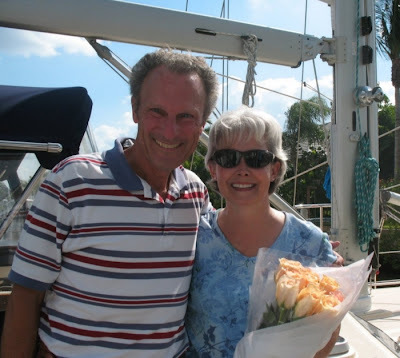 Instead, we went to Plan B: rather than continuing on the outside south of the Keys and around the west side of Key West (35 nm farther, but a safer passage due to deeper water), we passed north through Moser Channel and under Seven Mile Bridge to Big Spanish Channel, and found an anchorage near Little Pine Key. How does a boat with a 5' draft not run aground in water that is 3½-4' deep? That is the question I kept asking myself Saturday morning as I stood on the bowsprit in a futile attempt to guide Wayne through the "deeper" water, which in reality was "very shallow" and "shallower still." I'm 5'2 ½" and the water could not have been more than waist deep in places. A couple weeks ago, Wayne measured around the boat with a portable depth sounder to determine how much our depth instrument varied from the actual depth of the water. He found that the instruments give a reading one foot less than the actual depth - a good thing. 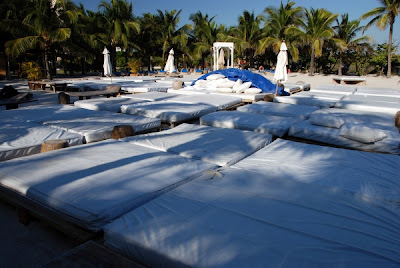 Taking that into consideration, we were still in 3½-4' deep water, literally plowing our way through the sand. Or whatever it was on the bottom. It obviously wasn't coral, I did not see weeds, and Wayne swears it couldn't have been sand because we would have been stuck in it. But what else could it be? Divine intervention? Very strange. Always one to make lemonade when handed lemons, I'm looking at the bottom, seeing (or imagining I see) conch and crabs galore and thinking "dinner!" - almost hoping we'll get stuck until the tide comes in so we can get out the snorkel gear. "Hmmm, our mesh laundry hamper with handles on each side would work great as a net for catching fish...Dang, did we bring our Florida fishing licenses or did we leave them at the house? Oh, and that island with the great sand bar over there? I'll bet there's great shelling, and I wouldn't even need to take the dinghy..." That's how my mind works. 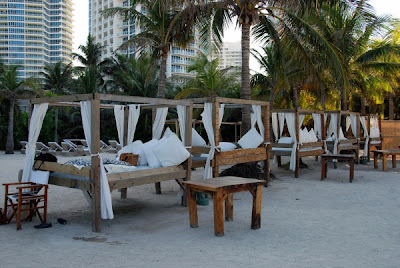 We decided days ago that dinner in Miami had to be at Joe's Stone Crab (not to be confused with Joe's Crab Shack), as we all had scrumptious memories of it from previous visits, so it wasn't by accident that we chose to dock at Miami Beach Marina, a block away. We knew it was a splurge (not just the dinner, but the marina), but justified it by saying it was our last dinner together, and also, it occurred to us, probably Wayne's and my last restaurant meal of the trip. We were not disappointed. No more restaurants...no more provisioning...no more doing laundry at marinas...no more refueling...no more water tank refills...no more pump outs...Reality is setting in - we're almost home, less than a week away (three hours by car, but I don't let myself think about that)! When I think back over the past three and a half months, it almost seems like a dream. Did we really do all that? Well over 4000 miles traveled and less than 300 to go. Unbelievable! Gary just left and it was sad to see him go. He's a great guy and we enjoyed his company. 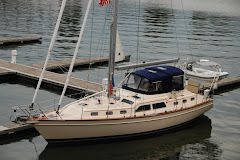 On Saturday we traveled the ICW from St. Augustine to Daytona Beach, where we anchored for the night. Sunday and Monday nights we docked at Melbourne Harbor Marina, where we rented a car and drove up to the Kennedy Space Center for the day. The three of us agreed that it was fascinating and well worth the visit. En route to the Space Center, we traveled over a bridge that we had traveled under the previous day, which is notable because our antenna went plink plink plink as it hit the support beams of the bridge going through. We've been traveling on and off with another Island Packet, Gigi, and together we've braved the bridges, sometimes taking turns at being the first to pass under. We've had some very close calls, including one yesterday where we backed under in order to extricate ourselves more easily if it looked like the anemometer would hit. 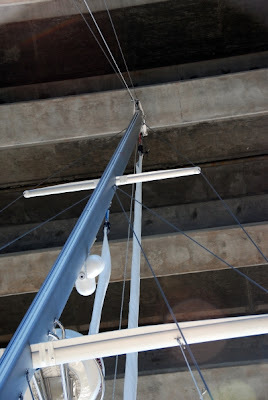 The flexible antenna of about 18" bent in half as it hit the support beams, but the anemometer was clear. If you're getting sick of hearing about bridges, imagine how sick we are of passing under them. We've been able to have the genoa (one of the sails) up quite a bit in the ICW. 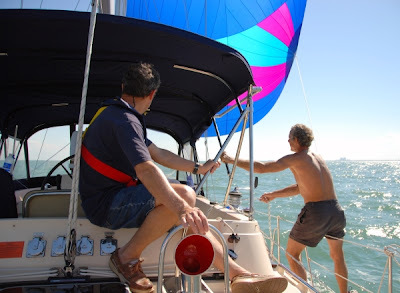 Gary is a very experienced sailor, and by his account, 99% of his experience has been racing. It doesn't matter that there's no one to race with; he's like a race horse who just has to do what he was bred to do, so if the sail is up, he is constantly trimming it to maximize speed. I told him we would have been in Punta Gorda weeks ago if he had been with us the whole trip. It's been fun having him aboard. Yesterday we left the confines of the ICW for the blue waters of the Atlantic so we could fly our spinnaker and avoid a multitude of bridges. 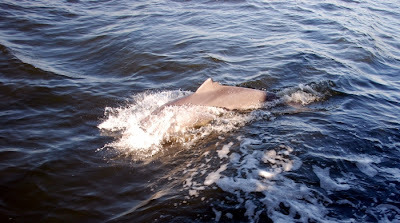 Surprisingly, there are very few safe inlets for passing between the ICW and the ocean because of shoaling and other hazards, and we would have gone outside sooner had there been the opportunity. We didn't have a lot of wind, but definitely made the most of what we had. It was much more pleasant than our day out last week. As much as I like to sleep with a little wave action, last night's anchorage (in the ocean, about half a mile off Jupiter Island beach) wasn't much fun. There was way too much rolling with the waves hitting us from the side, and that made dinner preparation a worse chore than normal, even though I only needed to heat things up. Sleep was another challenge, and I don't think the three of us got a combined total of eight hours. We decided not to fight it and got under way at about 3:30; Gary and I were able to go down and catch a few more hours of sleep. What a wonderful feeling it was to sail across the Florida state line on November 1! In the back of my mind it has been my target date, and even though we weren't specifically shooting for it, we were right on. We're definitely on the home stretch now, and should easily make it to Punta Gorda by the 15th, if not sooner. and the home styles with pool cages and tile roofs. There's a lot more boat traffic, and power boaters here aren't as courteous - many roar by without warning and without slowing down, leaving us to rock wildly in their wakes. In the Carolinas and Georgia, they always radioed us to state their intentions or ask permission to pass, and always promised (and kindly gave us) a "slow" or "gentle" pass. Many do here as well, but we can't count on it. It especially disturbs me to see so many power boaters ignore the manatee zone signs. Although Hurricane Noel started out on Friday directly east of us and a little over 400 miles away, the effect on us in the ICW was negligible. Had we been in the Atlantic, we'd probably have a story to tell that would make Wednesday sound like a walk on the beach. Sorry to disappoint you, I know you would have enjoyed the excitement. Had the insurance company not given us the go ahead to travel south of Cape Hatteras before November 1, we'd probably be hunkering down for a couple days, partly because wind and waves would have made going under all those bridges much more treacherous. Looking at where Noel has been and where he's headed, where we've been and where we could be now, we have no doubt that God continues to protect us. For that and for who He is, we give God thanks and praise. Friday we anchored off Amelia City, Florida. Yesterday we docked at Camachee Cove Yacht Harbor in St. Augustine and borrowed the marina's courtesy car for a quick look around town. We parked the car and strolled the narrow old cobblestone streets lined with old Spanish architecture. St. Augustine was founded in 1565 as a Spanish military outpost and is the oldest continuously occupied European settlement in the United States. Traces of the city's Spanish heritage are everywhere, and we were taken with its charm. We only had a couple hours, unfortunately, because we had to return the car. Gary treated us to a wonderful dinner at the marina, after which he went for a run and returned to find the little city hopping with nightlife. I received an interesting email from a friend commenting on Wayne's post from yesterday. Here is an excerpt: "...A fascinating juxtaposition of your blog from the day before and his today. You wrote of the tumult and Wayne begins simply "Well after a great day in the Atlantic..." what a contrast. When I finished your blog with the image of you curled up on your bed and Gary off somewhere fighting being green, I wondered how the captain fared. I learned today in his blog and clearly he fared well..."
Captain Wayne: Oops! I was laughing as well! The "great day" in my post was intended to refer only to the distance we covered that day. The ride was as uncomfortable as any I have been on. The waves were steep and coming from several directions. They were actually piling into heaps most of the day. Gary called them "hay stackers,” which is a great description. 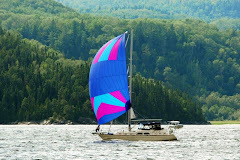 The wind was so close off the stern that sails did not help the motion. I hope we can avoid more of these. At least we were nice and secure in our Island Packet even if we were all a little "green." Well, after a great day in the Atlantic yesterday, or at least a day where we covered a lot of distance, today we only made 48 nautical miles instead of the planned 69. We started out making great time. With 15-25 knot winds, we were sailing down the ICW at over eight knots most of the day, so we expected to easily arrive at Jacksonville Beach by 3 p.m., well ahead of my calculated time using seven knots average speed. If you guessed our delay was due to bridges again, you are correct. We arrived at the Seaboard System Railroad Swing Bridge about 2:15 p.m. The bridge is normally open, but a train was coming, so we had to wait about 20 minutes in strong wind and currents until the train passed and the bridge was slowly opened. This bridge is immediately followed by 65' twin fixed bridges. Because we were nearing high tide, with higher than normal high tides due to the lunar cycle and strong current, I was especially concerned, so it was all hands on deck to see if we could clear. 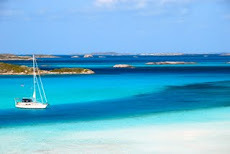 It just so happened that an Island Packet 440 with the same mast height arrived just behind us with the same concerns. They were glad that they could watch us to see if we made it before trying it themselves. As we approach a fixed bridge, the first thing we look for is tide boards, which tell us the height of the bridge based on current water level. There were none in sight. After going through the swing bridge and slowing the boat as much as possible against a following current and 20 knot winds, I noticed the tide board on the right side placed sideways so you had to be almost beside it to read it. It showed 62', which is 18" less than needed for us to pass under the bridge. So I had to turn around in the narrow channel while warning the other boat that there was not enough clearance. Fortunately, I was able to stop and turn around in the narrow channel less than 30 feet from the bridge. I am sure glad that Lena Bea has bow thrusters, a feathering propellor, and a powerful engine to be able to turn around in a 1.7 knot current with following winds of 18-22 knots. After getting clear of the bridge, we anchored to wait for the tide to go down. I calculated that we would have to wait until about 5:12 p.m. before we would clear the bridge. 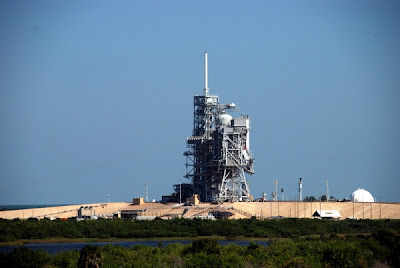 We went under at about 5:20 with only an inch or two to spare (we think the antenna may have ticked against the bottom of one of the support beams), three hours after we arrived! We then had to anchor earlier, before dark, which meant we could not make it as far as we wanted. We found a great place to anchor about five miles after the bridge, but we will not be able to get to St. Augustine as early as we were hoping for tomorrow. So cruising goes on the ICW. At least our mast is undamaged and we are securely anchored. Michele made a wonderful dinner again, and now we can relax and plan the next segment of our trip. Weather is keeping us in the ICW for at least another couple of days, and we are glad that Hurricane Noel is continuing the projected path to the northeast. I get real time information via Sirius and can track it on our Raymarine E80 displays. Wed., Oct. 31 - It was one of those days where you just pray to make it to the anchorage, as quickly as possible and without throwing up. We avoided the hazards of the ICW in this section and made twice the distance (101 nm) we would have otherwise, but it wasn't a freebie. Eight to ten foot waves (some higher) in the Atlantic left us all feeling pretty green around the gills - especially Gary, who unlike us, doesn't have three months of getting used to it under his belt. He and I slept as much as possible, which is about all you can do to get through it. We left the marina at 4 a.m. I went around and made sure everything was secure, then did it again after we got out in the ocean and the second tier of stuff went flying around the cabin. But today was a three-tier day: stuff that had only gone flying a couple times on the trip went flying again today. With an extra guy on board, they didn't really need me, so I was able to take care of myself. Sleeping in the cockpit was next to impossible without being strapped in because it was so rough, so I went downstairs. To keep from rolling, I laid across the mattress at the head of the bed with pillows between me and the cabin wall to cushion myself from being thrown against it. On my other side, I put a rolled-up quilt stuffed with pillows. It was still pretty hard to sleep, but at least I was relatively safe and comfortable. I don't think we saw a single other boat out there; few boats can handle the conditions we had, and there are, arguably, none better than the Island Packet. We anchored off St. Simon’s Island, Georgia in time to have an early dinner. We were all in bed by 8:00. It feels good to be in the calm and security of the ICW again today, and the view is better, too.